Each year around Valentine’s Day, we provide Emergency care to cats and dogs who have eaten flowers or candy that were gifts for their owners. 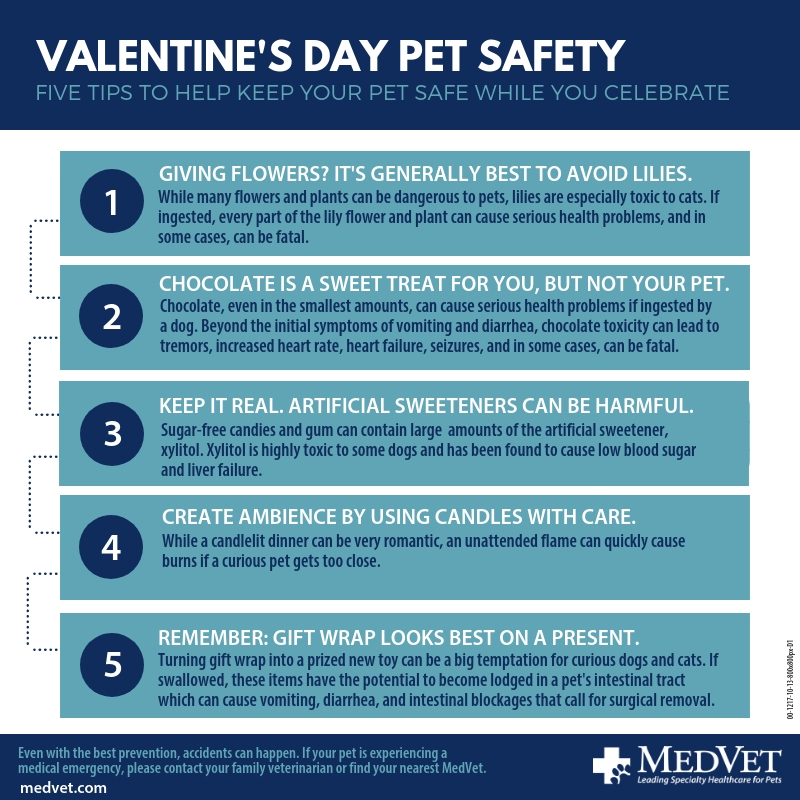 Below are some of the more common Valentine’s Day pet hazards and tips on how to keep your pet safe. A Valentine’s Day favorite, chocolate contains a chemical called theobromine that is highly toxic to dogs. The darker the chocolate, the greater the concentration of theobromine. Ingesting even small amounts can lead to nausea, diarrhea, vomiting, increased heart rate, seizures, heart failure, and death. Immediate veterinary care is recommended for any dog that consumes chocolate. Chocolate is also toxic to cats, but poses less risk, as cats are generally uninterested in eating chocolate. Small, tough wrappers like the kind found in many Valentine’s Day chocolates also present a hazard, as they can lodge in throats or digestive tracts, requiring surgery to remove. Lilies, including all members of the Lilium and Hemerocallis genera, are highly-toxic to cats and often fatal when consumed. All parts of the plant, as well as the water the lily flowers have been stored in, can cause poisoning, even in small amounts. Lily poisoning can lead to vomiting, lethargy, loss of appetite, dehydration, tremors, and seizures. It is usually fatal unless treated within the first 18 hours following ingestion. There is no direct antidote, but treatment to purge the toxins and IV therapy can help a cat survive. Xylitol is a sugar-free sweetener used in chewing gum, baked goods, and many other products created for human consumption. Xylitol can be highly toxic to dogs, causing low blood sugar and liver failure. Creating ambiance with candles can be very romantic, however, an unattended flame can quickly cause burns if a curious pet gets too close. Use battery operated, flameless candles instead if you have a pet that is likely to get too close. Gift wrap and trimmings can be very pretty, but it can also be a big temptation for curious dogs and cats who want to use it as a new toy. If swallowed, gift wrap and trimmings have the potential to become lodged in a pet’s intestinal tract, which can cause vomiting, diarrhea, and intestinal blockages that call for surgical removal. Even with the best planning, accidents can happen. If you feel your pet is having a medical emergency, please contact your family veterinarian or find your closest MedVet.